In just a decade, technology has changed so much in the insurance industry. Blame the Internet, which has given rise to new software-as-a-service models that let us conduct business as usual in the cloud. Consumers are addicted to their smartphones, the evolution of fast service, and the immediacy of data at their fingertips. This has forced the insurance industry to respond by growing more mobile, flexible, and responsive to customer demands. Want to know how cloud technology can help your business? Get a free assessment now. 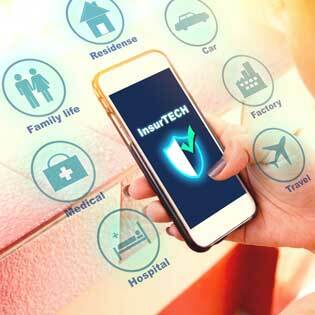 The next wave of digital disruption in the insurance industry will be driven by “insurtech” — technology companies entering the insurance market with a new range of services built around digital devices. Let’s look more closely at how insurtech and cloud technology will affect innovation in a very traditional industry in the next 10 years. Investopedia points out that insurtech startups are evolving rapidly into a multi-billion dollar industry in 2017. These startups have not been stymied by U.S. regulatory restrictions, and are in true Silicon Valley growth mode. They are viewed as the opposite of the behemoth corporations that rule this market sector. The insurance industry has been mired in legacy platforms and on-premise applications. On the whole, they are just now moving toward cloud technology for enterprise data warehousing and other applications designed to leverage the Internet’s benefits. Forcing the big companies to move more quickly is a new generation of insurtech startups. Picture a border collie nipping at the heels of a large herd of sheep and you’ll get a sense of how these smart, nimble startups are forcing change on a set of potentially reluctant enterprise insurance carriers. Who are these disrupters? There is the Oscar Insurance Company, which offers consumers coverage without some of the complications that spring from a traditional carrier. Telemedicine is a key feature of coverage; you can see your doctor online for routine treatments. Preventative care is free and copays are low. We hear Trov is coming to the U.S. later this year. Trov is an app that lets you insure personal property as needed. You can insure a laptop, photography equipment or a lawn mower at the swipe of your phone and turn the coverage on or off, as you need it. Into the growing and lucrative cyber security insurance market, comes Cyence, an insurtech startup at the forefront of today’s digital environment. Cyence uses economics, data analytics, and risk management, to create an analysis of cyber risk. Last, but most certainly not least, is Lemonade, a disruptor “with a heart,” according to their website. The company uses cloud technology to offer homeowners and renters insurance for a great price. These are just some of the latest insurtech disruptors. They are the latest response to changes affecting the insurance industry. Cloud technology will only continue to disrupt the market. Whether you are a small or medium sized agent, cloud technology will continue to force you to evolve and respond with more flexible and fast options for consumers to peruse. Contact TOSSC3 to request a quote on cloud technology to make your agency more market-friendly.